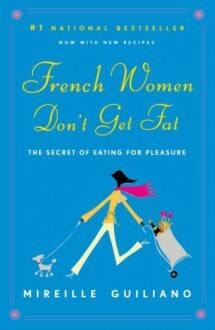 Stylish, convincing, wise, funny, and just in time: the ultimate non-diet book, which could radically change the way you think and live – now with more recipes.French women don’t get fat, even though they enjoy bread and pastry, wine, and regular three-course meals. Unlocking the simple secrets of this “French paradox” – how they enjoy food while staying slim and healthy – Mireille Guiliano gives us a charming, inspiring take on health and eating for our times.For anyone who has slipped out of her Zone, missed the flight to South Beach, or accidentally let a carb pass her lips, here is a positive way to stay trim, a culture’s most precious secrets recast for the twenty-first century. A life of wine, bread – even chocolate – without girth or guilt? Pourquoi pas? Interesting book, I know it's been debunked by several people but some of the points she makes are actually quite good! Little and often would appear to be the motto, quality over quantity every time! Interesting, and includes some nice recipes. Nothing mind-blowing, just some ways to practice moderation.